Chicken, fresh lemon juice and capers come together for one outstanding dish that’s perfect to serve your family any night of the week. 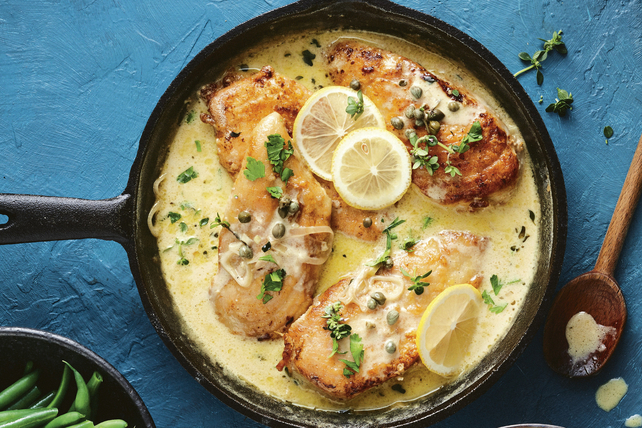 This Creamy Chicken Piccata recipe is simple enough for a weeknight entrée but it's also perfect for everyday entertaining. Combine flour and Parmesan in shallow dish. Cut each chicken breast lengthwise in half; pound to 1/4-inch thickness. Add, 1 piece at a time, to flour mixture; turn until each piece is evenly coated on both sides with flour mixture. Heat oil in large skillet on medium heat. Add chicken; cook 3 to 5 min. on each side or until done. Remove chicken from skillet; cover to keep warm. Add onions to skillet; cook 2 min., stirring frequently. Add wine; cook and stir 3 min. to scrape browned bits from bottom of skillet. Stir in pasta sauce. Return chicken to skillet. Simmer on medium-low heat 4 to 6 min. or until heated through. Transfer chicken to platter; drizzle with lemon juice. Serve topped with pasta sauce mixture and capers. Top with sliced fresh lemon and sprigs of fresh oregano or parsley before serving. Place chicken in freezer-weight resealable plastic bag; pound with side of heavy can or meat mallet until chicken is desired thickness.